This report provides a detailed overview of the market position and outlook in these two closely related metals, looking at supply and demand trends in each individually and addressing key issues for the future, including the impact of developments in the environmental arena and the recycling marketplace. Executive summary. Part 1 Lead: Key issues: An overview; Supply; Demand; Lead and the environment. Part 2 Zinc: Key issues: an overview; Supply; Demand; Zinc recycling. 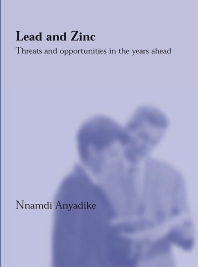 This report is written by Nnamdi Anyadike, who has many years' experience of reporting and analysing the international metals markets and their downstream sectors. He spent several years in Brussels working with a number of metals trade associations including the European Aluminium Association, Euromines and the International Steel Association. He has written a number of market intelligence reports on the metals, plastics and packaging sectors for various industry associations and other media including the Financial Times. The former editor of numerous journals and trade newsletters, Nnamdi Anyadike is currently Consultant Editor of Aluminium World.